Steps to migrate/move- database, data, and product installation. ADAudit Plus allows administrators to store and retrieve Windows servers' audit log data from MySQL, MS SQL, or PostgreSQL databases. By default, ADAudit Plus comes bundled with PostgreSQL database. To move the DB and/or data from PostgreSQL/MySQL to MS SQL, set-up the prerequisites first and then initiate movement. Open the SQL Server Configuration Manager on the computer running the MS SQL instance (to which the DB and/or data is to be moved). In the left pane, click SQL Server Services --> Ensure that the SQL Server Browser is running. In the left pane, click SQL Server Network Configuration --> Select Protocols for (the given instance) --> Enable TCP/IP. Note: The given instance refers to the MS SQL instance to which the DB and/or data is to be moved. In the left pane, click SQL Native Client Configuration --> Select Client Protocols for (the given instance) --> Enable TCP/IP. 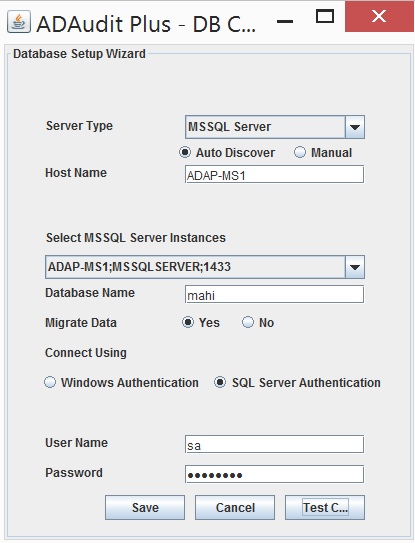 The user account associated with ADAudit Plus must have access and appropriate permissions to the MS SQL instance (to which the DB and/or data is to be moved). Note: To grant the user only the minimum permissions required instead of sysadmin permission, right click on the user --> Properties --> User Mapping --> Select db_datareader, db_datawriter, db_ddladmin in the checkbox and click OK.
Download and install- SQL native client (sqlncli.msi), command line utilities (SqlCmdLnUtils.msi), and ODBC Driver (msodbcsql.msi); in the computer on which ADAudit Plus is running. Note: Native client, command line utilities, and ODBC driver version has to be the same as the MS SQL version (to which the DB and/or data is to be moved). UDP port number is 1434. To find the TCP port number, open SQL Server Configuration Manager on the computer where the MS SQL instance to which the DB and/or data is to be moved, resides. --> SQL Server Network Configuration --> Protocols for . Right click on TCP/IP --> Properties --> IP Addresses --> IPALL --> TCP Port Number. Open the UDP and TCP ports under firewall settings. Invoke (ADAudit Plus Home)\bin\ChangeDB.bat in command prompt. Make sure that the user running the command prompt is same as the one running ADAudit Plus. DB Configuration wizard will pop-up --> Select server type as MS SQL --> Select the Host Name, Instance Name, and Database Name. iv. 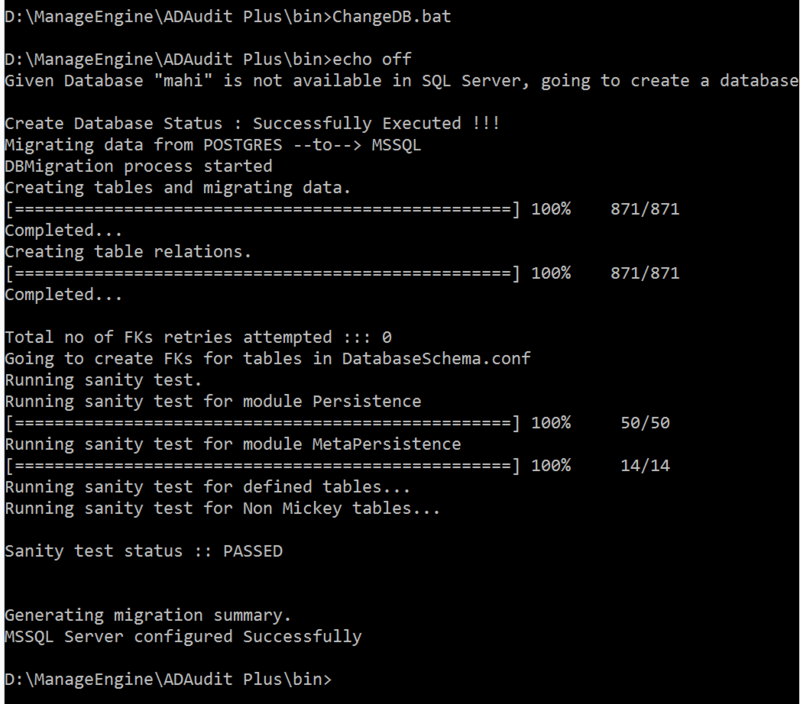 If you want to migrate existing data from the PostgreSQL/MySQL to MS SQL, then select Yes for the Migrate Data option. Otherwise, select No (for a new installation of ADAudit Plus).v. Select the Authentication type. If you have selected Windows Authentication, the credentials are automatically taken. If you have selected SQL Server Authentication, enter the corresponding credentials. Note: If SQL Server Autentication is used to move the DB and/or data, access and permissions to the MS SQL instace are automatically provided. However, when Windows Authentication is used, access and permissions have to be granted, as explained in point 2 under pre-requisites. Click Test Connection to check whether the credentials are correct. Recommended for: Full DB backup, moving DB data to another drive, moving DB data between different versions of SQL server (Ex: SQL Server 2008 R2 to SQL Server 2012). Right click on the DB that you want to move (Eg: adap). Select Task --> Detach. In the Detach DB wizard --> Select both the check boxes (Drop Connections and Update Statistics) --> Ok.
Go to the DB storage path (Ex: C:\Program Files\Microsoft SQL Server\MSSQL10_50.SQLEXPRESS\MSSQL\DATA) --> Copy the .mdf and .LDF files (Ex: adap.mdf and adap_log.LDF). Save both of the above files in a desired location. Right click on the destination database and select Task --> Attach. In the Attach DB wizard, click Add button. Select the .mdf file from where it has been saved --> Ok (the .LDF file will get selected automatically). Go to \conf folder --> Open database_params --> Change the SQL server location and DatabaseName, so that the product is pointed to the new DB. Recommended for: Moving particular table data from one DB to another. Right click on the DB that you want the data moved to (Ex: adap_new). Select Tasks --> Import Data. Authentication (Used to login to SSMS). Server Name (will get automatically detected, you can change the destination, if you want). Database (will get automatically detected, you can change the destination, if you want). Under Specify Table Copy or Query --> Choose Copy Data From One or More Tables/Views --> Next. Under Select Source Tables and Views --> Choose the tables to be copied from source, select the tables from the left column using Edit Mappings --> Select particular table operations --> Next. Check the Run Immediately box--> Next. Stop the ADAudit Plus server (Start → Run → type services.msc → Stop "ManageEngine ADAudit Plus" ). Copy the entire ADAudit Plus folder to the new server or drive. Ensure both folder sizes are the same. Open the command prompt [with Administrative privileges] \ManageEngine\ADAudit Plus\bin --> Execute InstallNTService.bat. If you want to start the product as service, go to Services.msc --> 'ManageEngine ADAudit Plus' Service --> Right click on properties --> Click on 'Log on' tab and select 'This Account' --> Provide the suitable credentials. Note: If you are using MS SQL server as your database and if the MS SQL server is running in a remote computer- Download and install SQL native client (sqlncli.msi), command line utilities (SqlCmdLnUtils.msi), and ODBC Driver (msodbcsql.msi); in the computer on which ADAudit Plus is running. Check the product build number. Install the latest 64-bit version of ADAudit Plus in a different computer. Do not start the product. Provide a different name for the below folders in your 32-bit installation. Now copy the following folders from the 64-bit build installation folder and paste it into the 32-bit installation folder. Go to \ManageEngine\ADAudit Plus\conf folder in 32-bit installation. Open product.conf file using Wordpad. Copy the wrapper.conf file from the location \ManageEngine\ADAudit Plus\apps\dataengine-xnode\conf\ in 64 bit installation and replace it in the 32 bit installation. Start the 32-bit installation and re-apply the license file.